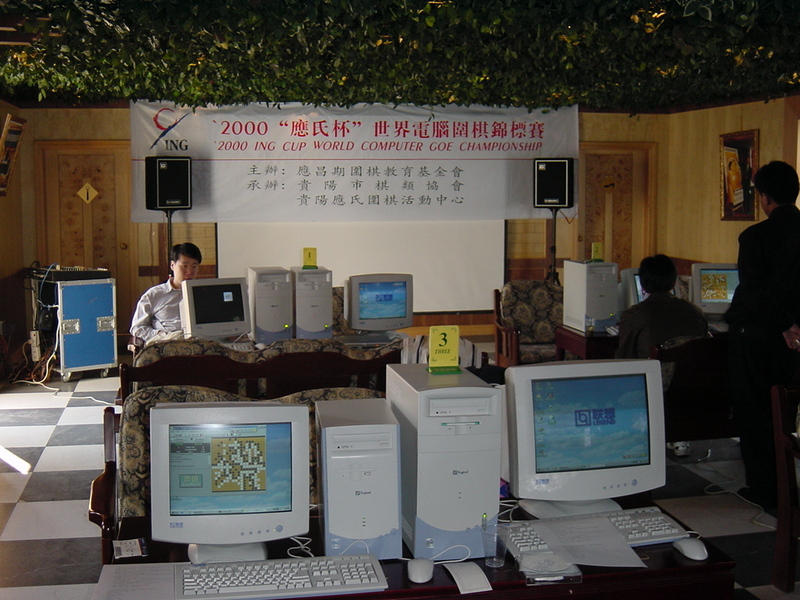 The 15th annual Ing Computer Goe World Championships were held in Guiyang City, Guizhou Province, China, November 5-6, 2000. The fight for the top prize was fast and furious. At the end of the day, Wulu, an up-and-coming PRC effort, prevailed over the field of 14 entries. Unsurprisingly, Wulu then went on to suffer three ignominious defeats (at nine stones) at the hands of three local dan-level youngsters. I still haven't met anyone who has ever heard of Guiyang, a lovely, friendly town in Southwest China  click here to see Guiyang on a map. Guiyang is a proud city of three million, with a glittering new "Guiyang Chess Club" building, completed only last year, and providing the venue for the competition. During the tournament, Guiyang certainly lived up to its name as the City of Eternal Spring  we experienced bright, warm fall weather. Rounding out the top three were Goemate, another PRC entry, and Go4++ from the UK. Putting in a strong showing was the Korean entry Fungo. Fungo's inability to place in the top three, as well as the order of the top programs, was greatly affected by a number of upsets, or perhaps we should call them huge blunders. Fungo threw away "won" games against both Wulu and Go4++, as did Goemate in a game against Go Intellect. The accounts above and below are from different people. This year was to be the last for this competition, and it was held in Guiyang, China. The organizers did a wonderful job, providing fast computers, good food, and excellent sightseeing. 14 programs competed, and as usual, the top finishers have full time programmers. There were several upsets and the final result was surprising. The lesson for the go programmers is that accurate life and death reading has become really important. Many games between the top programs were decided by life/death reading failures. Go4++ was the favorite, since it was last years's champion, and Michael has done extensive testing against the other programs, with good results. But Goemate, KCC Igo, Haruka, Wulu, and Fungo also have full time programmers, and they all expected to place in the top 3 spots. I worked on other projects last year, so Many Faces was not much stronger, and I expected to finish 4th or 5th. The tournament had 7 rounds, which gives most of the top programs a chance to play each other, for a more reliable result. At the end of the first day, with 5 rounds played, Goemate had the lead with 5 wins. Wulu and Fungo had 4 wins each. These two had not played each other yet, and had lost already to Goemate. It looked like they would be fighting it out in the last 2 rounds for 2nd and 3rd place. Yong Goo Park was expecting his first top-3 finish. Goemate beat Wulu by 110 points, Haruka by 66 points, Many Faces by 56 points, Go4++ by 39, and Fungo by 11. After these results, it seemed clear that Goemate would go on to win the contest. In an upset victory, Many Faces had beaten KCC Igo by 50 points, but lost to Goemate and Fungo. Go4++ had only 3 wins, having lost to Wulu and Goemate. The game between Go4++ and Goemate was very close until GO4++ ignored several attacks on one group, and it died. KCC Igo lost to Many Faces and to Go4++. Haruka lost to Goemate and Go4++. In the 6th round, Goemate was paired with KCC, Fungo with Wulu, and Many Faces with Go4++. We expected Goemate and Go4++ to win, and the game between Wulu and Fungo to determine which of those programs would place in the top 3. In the game between Go4++ and Many Faces, Many Faces took an early lead, and had it slowly whittled down to about 5 points (according to Many Faces' on screen score estimate). Go4++ doesn't display an estimate. But after the passes, it turned out that Go4++ had won by 9 points. The estimated score was incorrect. In the game between Fungo and Wulu, Fungo killed a group and had a clear lead up to the late endgame. Then Wulu started trying to make unreasonable invasions to catch up. After 3 unanswered moves, it had some threats to make its big group live. Finally, Fungo tenuki'd one more time and the big group came back to life, and Wulu won. In the game between Goemate and KCC, KCC made the same tricky attack on a 3-3 point invasion in two corners. Goemate defended incorrectly and one of the corners died. It couldn't recover from this early mistake, and lost by 17 points. So, going into the last round, Goemate and Wulu had 5 wins. KCC, Fungo, Go4++, and Go Intellect had 4 wins. Go Intellect had early losses against Many Faces and Haruka, so it played weaker programs and collected some wins. Go4++ was paired with Fungo and Goemate with Go Intellect. The others were paired with weaker programs. We expected Goemate to win, taking first place. The game between Go4++ and Fungo was critical for both programs. Since the other top programs would win, the loser of this game would fall below the other top programs. When the dame were filled, Fungo was 15 points ahead. But since there is no penalty for playing inside your opponent's territory under GOE rules, Go4++ started making very unreasonable invasions. 90 moves later, including about 10 passes by Fungo, Go4++ made a ko for life, ignored a ko threat, and won the game. Mr Park was stunned, and sat looking at the final position for quite some time. The game between Goemate and Go Intellect was the last to finish. Go Intellect has an old bug that causes it to lose communication, and it happened around move 130. At that point Goemate was about 75 points behind, having killed several groups. It took a long time to get the programs to continue the game. When the game was almost over, Go Intellect tried to bring its stones back to life, and after about 6 unanswered moves, was able to make a ko and live, and win. This upset put Wulu in first place, and Go intellect in 4th. Fungo dropped to 7th. Many Faces took 8th because it had the bad luck to be paired with Ocean in the second round, and Ocean won no games. Three crucial games were decided by a program messing around in the opponent's territory (goemate-intellect, go4++-fungo, wulu-fungo). The worst offender was Go4++, which played on for 90 moves after the dame were filled. In all three cases, the program messing around eventually won, so it seems that for computer vs computer go, this is an important feature. There was a rumor that the Ing competition will be extended for 10 more years, but it was unconfirmed. In spite of the results, I think Goemate is the strongest program, with Wulu, Fungo, and Go 4++ very similar in strength and a little weaker. All programs still make some very basic mistakes in life and death reading. Many SGF game records are available from this event.